Does the New Year mean resolutions for you? If you are like many people, dieting, exercise, better money management, and more living “in the moment” (slowing down, prioritizing) top your list of changes. At the University of Washington, they studied people making New Year’s resolutions. They found that "The keys to making a successful resolution are a person's confidence that he or she can make the behavior change and the commitment to making that change," says a researcher. The study also indicates that "resolutions are a process, not a one-time effort that offers people a chance to create new habits." Even if people are successful, they need to follow-up on their behavior over the years. • Have a strong initial commitment to make a change.• Have coping strategies to deal with problems that will come up. • Keep track of your progress. The more monitoring you do and feedback you get, the better you will do. • Not thinking about making resolutions until the last minute.• Reacting on New Year's Eve and making your resolutions based on what's bothering you or is on your mind at that time.• Framing your resolutions as absolutes by saying, "I will never do X again." Persistence can pay off. Of the people who successfully achieved their top resolution, only 40 percent of them did so on their first attempt. The rest made multiple tries, with 17 percent finally succeeding after more than six attempts. "Take credit for success when you achieve a resolution, but it is a mistake to blame yourself if you fail. Instead, look at the barriers that were in your way. See how you can do better the next time and figure out a better plan to succeed. You do get to try again and can make behavior changes throughout the year, not only at New Year's." What does this mean for those of us mindful of our money? According to financial experts quoted by the Associated Press, New Year or not, there is no better time to improve your financial circumstances than today. Evaluate your spending and investing. Think ahead, they suggest, to the day that you will be thankful that you made allocations for the future. Preparing for the future financially may require learning more about money and how to make it work for you. Make it your goal to know more about your investments and insurances (life, home, health—evaluate periodically as your needs change). Seek reliable, reasonable, and recommended financial advice. The best advice of all is to track your progress-and any detours-as you journey through the New Year. Keep a log of your money savings, track your progress towards goals and document what you have learned. When you can show yourself positive change, you will be inspired. Share your goals and progress with others. Use the buddy system and enlist the encouragement of your family or friends! Even with several months left of winter and rain I am still ready for some sunshine and my kids are ready to hit the pool again. Legendary artist, philanthropist and marine lover, Wyland, has teamed up with FINIS, Worldwide Leader in Technical Swimming Development, to create a new line of fun and lively ocean-inspired swim gear. Now available in stores, the range of colorful snorkels, masks and fins emulate the colors and aesthetics of marine wildlife introducing children to an “under the sea” swimming experience. Wyland’s hope is that the new line of high-end but affordable and fun swim gear will help raise awareness amongst today’s youth and educate them about the dangers that the world’s oceans and wetlands currently face. Every child dreams of being a mermaid or a dolphin when they think about the ocean, with that in mind FINIS and Wyland have created the “Dolphin Tail”, a unique piece that slips onto both feet at once and secures them with an adjustable Velcro strap. Feeling like the “Little Mermaid” the child can swim easily with this fun lightweight fin. Available in aqua or pink, they resemble the swimming technique of an actual dolphin, fish, or mermaid in the sea. The Dolphin Tail is available for $29.99 at www.FINISINC.com. For the older kids, there is the “Whale Tail” monofin, a larger, firmer version of the Dolphin Tail. These fins are tailored towards anyone over the age of 12 who is simply looking for a little fun while swimming. Designed for kids and adults with shoes sizes 1-7 for kids and 8-12 for adults, these adjustable fins make for fast underwater swimming. The Whale Tail retails at $49.99 for kids and $89.99 for adults and is available at www.FINISINC.com. Your child can go under the sea and explore with these ocean inspired Guppy Goggles and Explorer and Elite Mask and Snorkel sets. These goggles, masks and snorkel sets boast superior-quality materials, an ergonomic design and comes in sizes for both youth and adults. The goggles are available for $11.99-$14.99 and the mask and snorkel sets are available for $24.99- $49.99 at www.FINISINC.com. For more information, visit www.FINISINC.com. WIN: 24/7 MOMS and Finis Inc are giving away one Wyland Dolphin Tail and mask and snorkel set. US entries only and one entry per person. Winner will be chosen on January 10, 2010. Think Taxes Now –Save Time & Money Later! Given To Charity This Year? – This is a good time to gather your charitable giving receipts. Are there any other deductions you want to acquire before 2010 begins? Consult your tax preparer or IRS.gov for information. IRS.gov also has a list of reputable charities – check here before you give to an unfamiliar charity. Contribute to an IRA for yourself and your spouse. You have until April 15, 2010 to make IRA contributions for 2009. (From cnn.com: check out CNN.com or MSN.com for their money-related articles). Consider your withholdings allowances and withholding status: Though many of us look forward to a tax refund every year, ask yourself if what you’re getting back could be paid to you throughout the year, instead of loaning it to Uncle Sam at 0% interest—wouldn’t that be better? Evaluate your W-4 and see if any changes can be made. Get Organized: Make it a resolution! Designate one area in your home and one set of files to organize all of your financial/home data. Start collecting those pieces of information that you’ll need at tax time. Being organized can save you lots of time and money when you know what you have and can find it fast! This includes receipts for big purchases, warranties/instructions, credit card statements, etc. This site has information for parents, teachers, homeschoolers and individuals who want to teach kids money matters—and learn for themselves as well! Read more about personal finance and other helpful money saving/investing/credit ideas. http://finance.yahoo.com/taxes Several finance articles on money and personal finance can be found here. Lots of information on new tax laws and how to prepare for filing taxes. Q: What is one New Years resolution you would like to make? Q: Why did the little grape try not to snore? A: It did not want to wake the rest of the bunch. I will be completely honest I have a love hate relationship with teacher conferences, report cards coming home and IEP (individualized education plan) meetings. Being the mom to what we call a puzzle child never makes these events ones I look forward to. What mother wants to hear the shortcomings of their child whether it be academics, social skills, physical abilities or_________? None that I have ever meet. We moms of puzzle children have to dig deep and hang onto the positives, the smallest accomplishments, the milestones that are finally accomplished even if they are years behind what society calls normal. Last month I attended our two youngest boys Teacher conferences. When I sit in meetings and the topic is Caleb our puzzle child I often have to bite my lip and hold back saying more then I should. I look at these specialist/teachers wondering if they are telling me everything there is about my child's lack of accomplishments, if they are advocating enough for my child, if they are as concerned as I am, if they truly understand my frustrations and fears and mostly I wonder if they are telling me everything there is available to us with a child that has an IEP (individualized education plan). I leave these meetings always feeling like isn't there more our school system should be offering for the puzzle children. Now don't misunderstand me I feel very fortunate that Caleb is in the school he is , to have the teachers and specialist he has, to know that he is happy and feels secure at school each day. I only question the system and does the system keep our teachers from really giving our children the best education they need and deserve. How many times have I heard "He doesn't qualify!" yet knowing he is in need of the additional services. Does that mean my child is actually being denied the same education of the non-puzzled children or the highly capable children? I often feel I am alone on this journey, advocating for my child in a system that I am not fully aware of what it has to offer him or what I should expect from the system. What happened to no child left behind? How does one look me in the eyes and say "We are giving him all the services he qualifies for". Yet, he is getting further and further behind his classmates. I can assure you that as I attend each Teacher conference, IEP meeting and see my child's report cards I will continue to be his advocate, I will continue to discover the system that I am not fully aware of. I will not give up on or give into the system when it comes to my child or your child. Do you have a puzzle child in your world? What are your thoughts and concerns about the education your child is receiving? These tasty twists made with pesto, hazelnuts and Parmesan cheese are a delicious way to start the evening. PREHEAT oven to 400° F. PLACE pastry sheets on lightly floured surface. Roll each sheet into 12-inch square. Spread pesto over one rolled pastry sheet. Sprinkle nuts and cheese evenly over pesto. Lay second sheet on top and press lightly. Cut into twelve 1-inch-wide strips. Twist each strip and place on baking sheet. BAKE for 15 minutes or until light golden brown. Pretty spirals filled with thin-sliced turkey from the deli, fresh greens, peppers, and creamy dressing, roll up fast for a quick lunch or appetizer. 1. In small bowl, mix mayonnaise and cream cheese until smooth. Stir in pepperoncini, cilantro and bacon. 2. Warm tortillas as directed on package. 3. Spread about 2 tablespoons mayonnaise mixture on each tortilla. Top each with 1 rounded tablespoon tomato, 1 slice turkey and 1 lettuce leaf. Roll up each tortilla tightly. Cut each roll into 8 pieces; secure each piece with cocktail toothpick. Serve immediately or cover tightly and refrigerate until serving time. Sports fans will tackle this winning recipe for Pesto Party Dip. Perfect on veggies, crackers and bread sticks, this delicious crowd-pleaser goes hand in hand with the big game. With its creamy texture and robust pesto taste, this dip is sure to score extra points. PLACE pesto, cream cheese, sour cream and Parmesan cheese in food processor or blender; cover. Process until creamy. SERVE with fresh vegetables, crackers, bread sticks or shrimp. PREHEAT oven to 400°F. Top half of each tortilla with 1/4 cup of the cheese and 1 Tbsp. each of the bacon bits and green onion. Fold tortillas in half; press lightly to secure. PLACE in single layer on baking sheet sprayed with cooking spray. BAKE 8 to 10 minutes or until edges are lightly browned. Join the building fun Saturday January 2nd at Home Depot's Kids Workshop and let your kids build their own Calendar for 2010. The Home Depot's Kids Workshops offer useful projects including the creation of toolboxes, fire trucks and mail organizers, as well as more educational projects, such as a window birdhouse, bughouse or Declaration of Independence frame kit. Ready to ring in the New Year but still in need of Simple and Yummy appetizers to feed your guest or take to the New Year's eve party your attending this year. Check out our 24/7 MOMS recommendation then enter to WIN it. Made with the highest quality chicken, these bold new flavors offer protein-packed options that can be customized with the two included sauce packets to satisfy any snacking occasion. Perfect for the after-school snack attack, the big game day party or even holiday hosting, these new varieties are sure to keep families and hungry guests satisfied. Plus, they’re ready in minutes, straight from the oven or microwave, making them an easy-to-prepare, no-hassle snack. WIN: 24/7 MOMS and Tyson are giving away One coupon for one FREE Tyson chicken product to two moms. Q: What is your favorite song to sing in the shower? Q: What has forty feet and sings? In 2009 24/7 MOMS Live became the #1 viewed MOM live webcast show and we are ready to make it even better in 2010 for moms across the world. Will you help us by Taking the 10 in 2010 survey? 24/7 MOMS wants to HEAR your opinions, ideas and suggestions and you just might WIN some Starbucks. Click here to take survey . Don't know what 24/7 MOMS Live webcast is all about: 24/7 MOMS Live is the #1 MOM webcast ( TV show on your computer). We air weekly on Tuesday nights 2 times 7pm PST and 9pm PST. The 24/7 MOMS live webcast is designed to be a live talk show for moms sharing the MOM journey with MOM tips, ideas, Real mom stories along with demonstrations and plenty of giveaways. Create a fun DIY pizza buffet for kids and adults. They will enjoy creating their own mouth watering pizzas with the toppings they like and enjoy. Set out ready to top pizza crusts, bowls of pizza toppings and cheese and of course a big bowl of pizza sauce. Tinycandy’s Gift is a new Christmas story tracing the origins of the popular holiday treat, the candy cane. For Susan Estes’ third book, she explains that it is children’s differences that make them special to the world and highlights through vivid illustrations just how important one person can be. 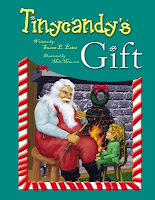 In Tinycandy’s Gift, Estes creates a unique history of how the candy cane got its name and weaves in a classic tale that conveys to children one of the pivotal rules of life. Estes has spent her life working with and raising children and believes that teaching them to appreciate their own and others’ differences is the most important lesson of all. For more information on the book and available read-a-long CD, visit www.seecreativeconcepts.com. WIN- 24/7 MOMS and Susan Estes are giving away one copy of Tinycandy's Gift book. My kids love the excitement of New Years eve, mostly because we allow them to stay up until midnight and enjoy the annual neighborhood party with all of their friends. What are you planning this New Years eve with your kids? 24/7 MOMS has compiled some fun ideas for you to create Family Fun this New Years eve as we leave 2009 and enter 2010. Creative Fun - Have craft station where kids can decorate and create their own party hats and noise makers. Provide hats and items to embellish them with, provide bottles filled with beans then allow kids to decorate with stickers and paper cut outs to create their own noise makers. Pinate' - Purchase a pinate' or make your own by using a large gift bag that you decorate wit New Years pictures/cut-outs, stickers and curling ribbon, fill and seal the top and hang by it's handles. Fill with small toys and candy. Party Crackers - DIY and Make your own party crackers. You can make your own by filling cardboard TP rolls with small prizes and candy. Then wrap with wrapping paper and tie the ends. They can also be purchased in party stores. Confetti Balloons - Have the kids punch paper circles out of brightly colored construction paper with a hole puncher to make their own confetti. (or use store-bought confetti.) Put as many confetti pieces as possible into each deflated balloon using a funnel. Blow up the balloons and hang them in reach of the children. A few moments before midnight ( or time you are celebrating), hand out the pins. Then when the clock strikes let the kids pop the balloons and let the confetti fly. Party poppers - (little plastic bottle) - You can purchase these at Target and I have even seen them at grocery stores. Family Slumber party - Everyone camps out together in your family room or bonus room. Allow your kids to make tents and forts to sleep in. OR have a kids only slumber party ( mom and dad get to sleep in their own beds). Time Capsule - Make a family time capsule. Use a paint can or other empty container. Fill with items from the past year, pictures, newspaper articles, grocery ad, TV schedule, event tickets and written memories and stories from family members about the past year. Bury it or place in your attic to pull out in 5 to 10 years. Kid Celebration - Celebrate the New year with your children earlier in the evening and set a particular time to welcome in the new Year such as 8:00 or 9:00 then put them to bed so the adults can celebrate kid free. Special Foods - Choose a desert or main course that become your yearly tradition to eat on New Years eve with your family. It could be anything form Take -out to something you cook at home. Or as simple as serving Sparkling cider. Family Letter - Write a combined letter with each family members input with memories, stories and thoughts about the year. Seal in an envelope writing the current year on it and put in a safe place to open 5 to 10 years from now. First Nights - Attend a community First Night event in your area. Google search for local information on your community celebrations. Lakeshore Learning Store offers free craft making opportunities for your kids each Saturday from 11am-3pm. These crafts are geared towards children aged 3 and up. Saturday January 2nd join in the creativity fun and make Precious Memories Photo Stand. Q: Do you prefer Cake or Cupcakes? A young man was visiting his brother and sister-in-law for Sunday dinner. As he arrived at their house he found his young nephew, Mikey, helping them bake some cupcakes. After they were done, his sister-in-law allowed Mikey to put the icing on. When the boy had finished, he brought them to the table. "The cupcakes look delicious, Mike." his uncle said. He took a bite and said, "Mikey these are so good." As he finished cupcake and took another, he again complimented his little nephew. "The cupcakes look beautiful, Mikey," his uncle said. "How did you get the icing so neat?" His nephew replied, "It was easy. I just licked them." The uncle turned pale. He pointed to the plate of cupcakes. "You licked all of these?" Mikey replied, "Well no. After a while my tongue got tired, and I got the dog to help." Deal of the Day - I think that I have been subscribing to Family Fun magazine since the year it hit the news stands - It has given me oodles and oodles of great ideas of fun with my kids. TODAY you can get a 1 year subscription for $4.95 from the 24/7 MOMS Amazon store. ( the price says $9.95 however $5.00 will be taken off at check out). Subscribe today at the 24/7 MOMS store in the magazine section. Freebie Of The Day - FREE Become Skin Care Weekender Sample Kit. When you sign up HERE. 24/7 MOMS wants to rock the mom world in 201o. So, we are looking for how you as a MOM want to improve, change or help your MOM world to rock in 2010. Tell us the areas you want to know more about, want ideas, want MOM tips or want help in. Anything from Home Organization, Meal planning, potty training, getting your kids to listen, making memories- Tell us what you want from 24/7 MOMS in 2010. Soak up adventure with Thomas and his engine friends as they travel around the Island of Sodor in the all-new Thomas & Friends™ Splish Splash Splosh arriving on DVD January 5, 2010 from Lionsgate and HIT Entertainment. Teaching timeless life lessons such as discovery, friendship and cooperation, the Thomas & Friends animated series invites children to enter a world of imagination through the tracks of a train and the words of a story. The new host, Driver Perkins is new on the Island of Sodor, and can be seen ONLY on DVD. Driver Perkins helps out Sir Topham Hatt, all of Sodor’s engines and the train engineers. This friendly character also engages children with interactive dialogue and extra fun, like showing how to make a cake that looks just like Thomas and more! WIN: 24/7 MOMS and Lionsgate And HIT Entertainment are giving away one copy of the all-new Thomas & Friends™ Splish Splash Splosh DVD. The Celebration is over, the packages are unwrapped and now it is either begin the un-decorating or continue the family fun. I choose the family fun, Ill get to the clean up once my kids are back in school. Ice Skating - Take your kids ice skating to either an indoor or an out door rink. PJ Day - Announce a stay in your PJ day. Allow your kids to hang out all day in their PJ's. Puzzle fun - Begin a family puzzle that you work on during your kids Christmas vacation. Gamer day - Announce an all day video Game day for the family. Even mom and dad get to play video games with the kids. Make up fun competitions, eat pic-nick style while playing games. Movie Day - Who doesn't love a movie day? Rent or watch already owned moves your entire family can enjoy. Pop that popcorn get out the left over Christmas treats and enjoy a day together. Museum fun - Play tourist and visit your local museums with your kids. Be sure to check for free and discount days. Plan a post Christmas party - Was life crazy the last few weeks and you never got around to hosting a Christmas party. Plan a post Christmas party for families. Family Reading - Did anyone get a new book that the whole family would enjoy? hold a nightly family reading time and enjoy a book together. 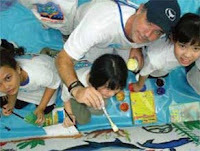 Art Projects - Do you have a kid art project you have been waiting to have time to accomplish with you kids. Now is a great time to do an art project with your kids. Scrap booking fun - Take a day and create a 2009 Christmas scrapbook of your activities and celebrations. Game Time - Don't put away the new games your children received without first playing them. Take time and have a family game night or day. Cooking Fun - Kids love to cook why not let them help you prepare a meal one night or better yet prepare and freeze a few meals for the busy days ahead. Q: What is one thing you would like to do during the rest of your Christmas vacation? Q: Why did the coach go to the bank? Get ready to THINK outside of Christmas - we have 9 what to buy ideas for you that will save you time and money during the after Christmas sales. 2. GREEN - Green dishes, candles and other items that can be used in your St. Patrick's day celebration. 3. Gifts , gifts and more gifts can be purchased for those upcoming Birthdays, Mothers day, Fathers day and weddings. Also keep an eye out for favors and decorations you can use for upcoming Birthday celebrations. Perfect time to fill up your gift closet for the coming year. 4. Easter fun- Purchase your Easter Basket fillers on sale now - Check out the sticking stuffer sections at Target and Walmart . 5. Planning ahead - Purchase the items you know you will need for next Christmas Including Gingerbread house kits, Gift wrap, Christmas cards, candles, paper goods, lights, stockings, ornaments, craft kits etc. 6. Ho Ho Ho - Think about your Christmas gift giving list for next year and buy gifts on clearance for teachers, annual gift exchange parties you attend, family members, your children etc. 7. Deals - Look for everyday items you are in need of that prices have been slashed on - Kitchen appliances, dishes, linens, clothing etc. 8. Groceries - Purchase food items that you usually purchase but are are in Christmas packaging. Such as cookies, crackers, cake mixes etc. Also items such as Kleenex, candles, paper products. 9. Think - When you are out shopping think outside of Christmas and how you can use the items on clearance for other occasions, celebrations and everyday. What do you buy during the after Christmas sales? Our big Christmas celebration is over and we had a fabulous Prime Rib dinner thanks to the Novotny Chef also known as the Dad and Husband in our home.